The New York Public Library for the Performing Arts at Lincoln Center has acquired the papers of renowned performers and acting teachers Uta Hagen and Herbert Berghof. The collection consists of thousands of pages of unpublished correspondence, diaries, scripts and manuscripts, photographs, clippings and other documentation relating to the dynamic theatrical careers of both Hagen and Berghof. This collection of professional and personal papers, spanning nearly 100 years of theater history, is being made public for the first time. To celebrate the bequest, the Library is planning a series of eight free public programs featuring many close friends and colleagues of Ms. Hagen and Mr. Berghof’s including such figures as Harold Prince, Edward Albee, David Hyde Pierce and Eli Wallach. The collection consists of 99 boxes of papers totaling 49 linear feet and provides in-depth insight about Ms. Hagen and Mr. Berghof’s personal life, their working processes in various theater productions, and their renowned acting school HB Studio, and includes correspondence from esteemed personalities such as Katharine Hepburn, Tennessee Williams, Jose Ferrer, David O. Selznik and Thornton Wilder. Mr. Berghof’s papers document the many productions which he performed in, directed, adapted, translated, or developed. The productions and projects span his entire career from the late 1920s to his final project in 1990. Included are materials and correspondence with Samuel Beckett regarding Waiting for Godot. The collection, entitled the “Uta Hagen/Herbert Berghof Papers” was bequeathed by Uta Hagen to the Billy Rose Theatre Division in 2007. It will be housed in the Billy Rose Theatre Division of The New York Public Library for the Performing Arts at Lincoln Center. A tour de force in the theater world for over seven decades, Uta Hagen’s numerous leading roles included Martha in the original Broadway production of Who’s Afraid of Virginia Woolf? 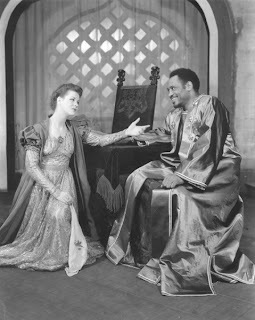 in 1962 (for which she won a Tony Award), Desdemona opposite Paul Robeson’s Othello, and Blanche DuBois opposite Marlon Brando in A Streetcar Named Desire. She taught at the tremendously influential acting school HB Studio, where her students included Matthew Broderick, Robert DeNiro, Liza Minnelli, Al Pacino, Amanda Peet, and Jason Robards. Ms. Hagen married its founder, the actor, director and writer Herbert Berghof in 1957. Mr. Berghof, who died in 1990, remains one of the most revered acting coaches in theater history. During the years he presided over HB Studio, the roster of alumni included – in addition to the ones mentioned above – actors such as Anne Bancroft, Geraldine Page, and Fritz Weaver. Mr. Berghof also had immense success outside of the school, and garnered much praise for directing the American premiere on Broadway of Samuel Beckett’s Waiting for Godot in 1956 and the first all-Black cast version of the play in 1957. Free Public Programs for Uta Hagen/Herbert Berghof Papers will take place in the Bruno Walter Auditorium in The New York Public Library for the Performing Arts at Lincoln Center located at 111 Amsterdam Avenue (between 64th and 65th streets). Admission to all programs is free and first come, first served. For information, please call (212) 642-0142 or visit www.nypl.org/lpaprograms. Programs are curated by Alan Pally, Manager of Public Programs at the Library for the Performing Arts.